Typing mistake: wrong address is given in the place for Recipient’s Address. Technical Error: may be the recipient mailbox is full or the size of your message is greater than the recipients max limit. Security Error: The sender email is blocked or not comes in the preferred list and hence it returned back by the receiver’s mail server. In this blog, we are going to tell you that how can you get List of bounced email via Postmark API. before putting next step , If you are new to Postmark API then first follow this post –> Send Email via Postmark API Using PHP and in that post you will learn how to configure postmark API in PHP and send mail through it . Use MailGet – Email Service Provider for Finding Bounced Email List, just connect and send with PostMark API or Any SMTP services. So , from the previous post ( Send Email via Postmark API Using PHP ), you already know how to send mail . now lets understand that how can we achieve success in getting information about bounced emails. To, get detail of bounced email , we have to send some email to wrong addressess and we fetch their details through our program . For send mail from postmark API through your PHP program follow the previous post –> Send Email via Postmark API Using PHP . now, i hope you already send some email to false addressess and we are going to learn how to fetch details about those bounced emails . call getBounce() function through client . which return you an object and you can fetch bounced emails list with its help . Below are the details of the code used in this tutorial with proper explanation. Below file is the main program file in which , we are connecting our API in the program and accessing its features like – creating object of postmark Client and fetchig details of bounced emails. // a PostmarkException can be thrown. A separate css style sheet for table used in index.php to show bounced emails list. 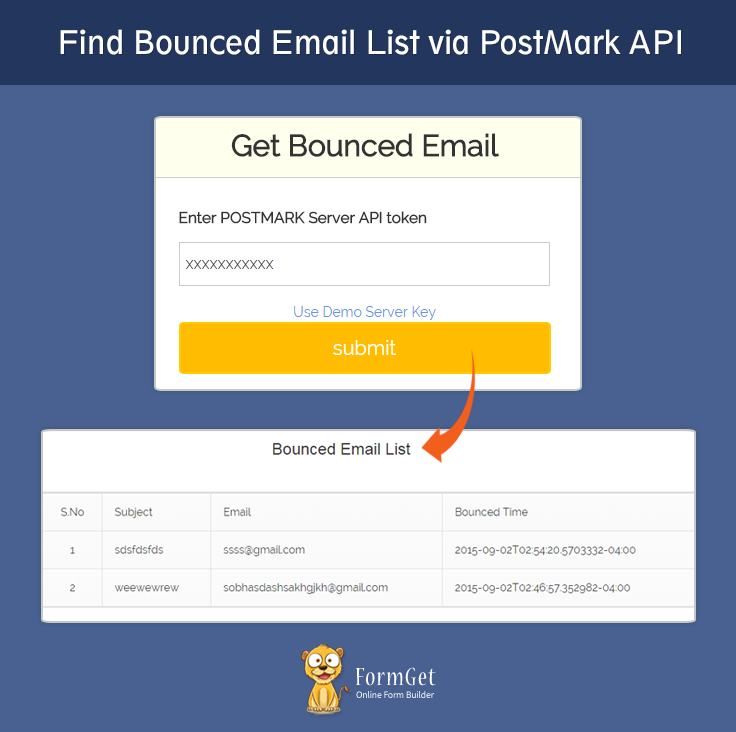 I hope now you understand , how we can find bounced emails list through Postmark API, I am sure you will try this code is your program .keep in touch with us anytime for new coding tricks . you can give your feedback in the below space.